Earn $3.12 in VIP credit (312 points)What's This? 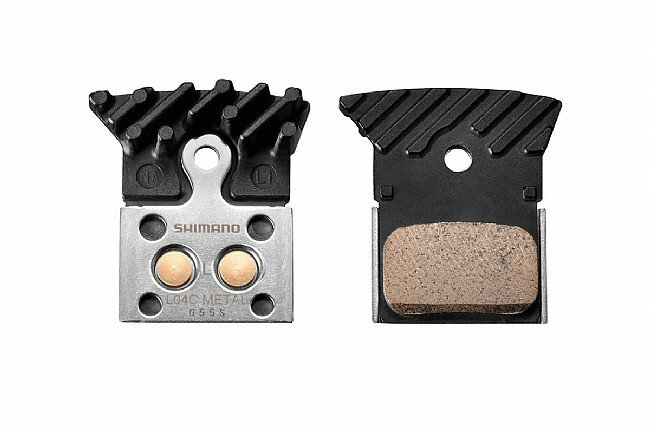 These Shimano L04C Metal Disc Brake Pads are direct replacements for those found in Shimano's BR-RS805 and BR-RS505 road disc brakes. The metal compound provides better stopping power in all-conditions but is less quiet than the L02A resin compound model. Integrated cooling fins help shed heat to reduce brake fade under heavy or prolonged braking. Got these along with new rotors for my rainwinter bike. Yes they'll stop your bike well, but they squeal so loud, they can be heard for miles. Stick with the resin. On my second pair of these pads and don't really have any complaints. One issue I did have was when the shop replaced my front RT-99 rotor with the cheaper RT-81 rotor. This resulted in a ton of noise and squeaks when braking. Switched back to RT-99 rotor and problems went away. Solid brake pads, but heat up relatively quickly and get squeaky. These are great brake pads but I feel that after moderate use they get squeaky from heat. I would still buy again but squeaky brake pads are annoying.